Anyone who has been hunting or practices hitting a target will tell you how useful it is to invest in a sight. Basically, a sight can help you enhance your performance with a firearm by increasing your accuracy. Traditionally, sights are used for gun training. However, the addition of sights can help anyone who is having trouble learning how to use a firearm properly. In this article, we will review the Tacticon Laser Sight. This device is designed to help improve accuracy through the use of a laser dot for increasing your aim. Care to find out the truth behind this claim? Then, read on! Unlike your conventional sights, this one is equipped with a laser sight. The laser is excellent when it comes to short-ranged targets, especially ones that are quick to move. This makes it ideal to be used for recreational hunting, airsoft, or professional training. Enhanced accuracy, increased range of vision, and versatility with installment options are just some of the reasons why this model is better than others on the market. The company is also owned by veterans, which ensures that the product is designed to function as intended. This laser sight is best for individuals who want to increase their range of vision and enhance their performance when it comes to using firearms. 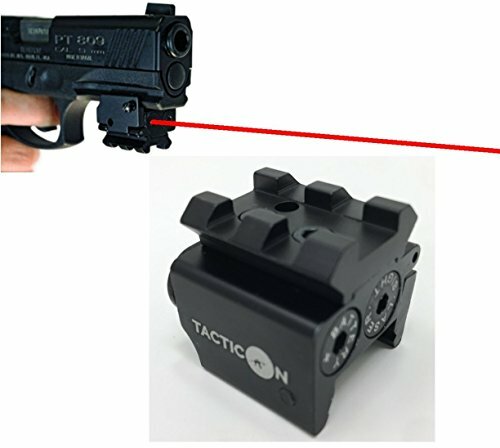 Anyone who is struggling to learn how to aim at a moving target properly can highly benefit from the use of the Tacticon Laser Sight. The laser design allows this model to drop the traditional style of looking through a scope and instead provides you with a strong laser which can be seen for up to 100 meters. This highly increases your visibility and will make it easier for users to become accustomed to using a firearm without a scope or extra attachments. As with all sights, the laser can be adjusted to zero in on a moving target. The kit includes an elevation and windage wrench which can be used to adjust the settings. The increased accuracy can help you land more hits. This laser sight can be attached to any firearm that has a Picatinny or a Weaver rail. Because of this, it can be attached to rifles, shotguns, or even handguns. Versatility is what makes this model better than others because you won’t find many laser sights that can be attached to smaller guns. Lasers can use up a lot of batteries. So, to help you manage this, the sight comes with two sets of batters. In this way, you’re ready to go when you get the package, and you won’t have to worry about the next set of batteries as the company graciously provides you with an extra set. Take the batteries out of the package and install them into the slots. After that, you’re going to want to test the laser and make sure it’s working. Don’t point it straight into your eyes, as this can be harmful and cause some damage. After you’ve tested the laser, it’s time to attach it to your firearm. Because of the design, you can attach it to any type of gun, provided it has a Picatinny or a Weaver rail. Attach it onto the gun, and you’ll be ready to go. Turn the sight on, and point it in the direction of the target you want to hit. You’ll see a small bright laster and a dot displaying where the bullet will hit. If you are trying to find a sight that is similar to the Tacticon Laser Sight, then take a look at the Suaoki Digital Laser. It can reach a higher distance of up to 600 meters and is equipped with 6x magnification. Unlike other models, this unit features a 1-meter accuracy, which means you can rest assured that you are on point every time. There are multiple modes: range, flagpole lock, golf distance correction, and fog mode. For added convenience, this scope uses a side display, which makes it extremely easy to read readings and measurements. Another feature is its rainproof exterior, which is designed to be lightweight and portable. It comes with a mountable bag, lanyard, and can be attached to a belt bag. Laser sights are extremely useful and can even be more rewarding than traditional sights. The biggest difference is that you won’t have to squint into a scope, which can cause your eyes to hurt and allow your target to get away. If you want a way to increase your accuracy, while also enhancing your performance, then consider choosing the Tacticon Laser Sight. Hunting in the Dark: Do Red Dot Sights Work At Night? Do Red Dot Sights Have Magnification? Some recommended products may use affiliate links. ShootAndAim.com is a participant in the Amazon Services LLC Associates Program, an affiliate advertising program designed to provide a means for sites to earn advertising fees by advertising and linking to Amazon.com. Amazon and the Amazon logo are trademarks of Amazon.com, Inc or its affiliates. Copyright © 2018 Shoot and Aim | All Rights Reserved.